The Athlete Support Programme (ASP) is a support scheme for all eligible para-athletes who have selected by the Singapore Disability Sports Council (SDSC) to represent Singapore in International Paralympic Committee (IPC)-sanctioned competitions, or SDSC-recognised competitions. The ASP was introduced and administered by the SDSC’s Sports Excellence department in order to identify and develop world-class athletes. It is one of the main pillars of the DISABILITY SPORTS 21 programme. The ASP is part of a larger sports excellence management framework that is designed to support all dedicated athletes with disabilities to excel in sports and achieve their maximum potential through a structured, developmental training programme. The eventual aim of this programme is to allow them to compete at professional levels. The ASP’s main purpose is to groom talented and promising athletes through a series of training programmes to achieve success in the international sporting arena. Additional to training, these athletes will also be given the necessary support to enable them to develop into world-class athletes and role models for the disabled community. These athletes will be categorised according to their sports achievements and potential. In recognition of the commitment that these athletes make to long-term training and competition programmes, these athletes will be entitled to certain support schemes and policies within those categories. This is to provide a holistic approach towards the development and welfare of these athletes in the long-run. 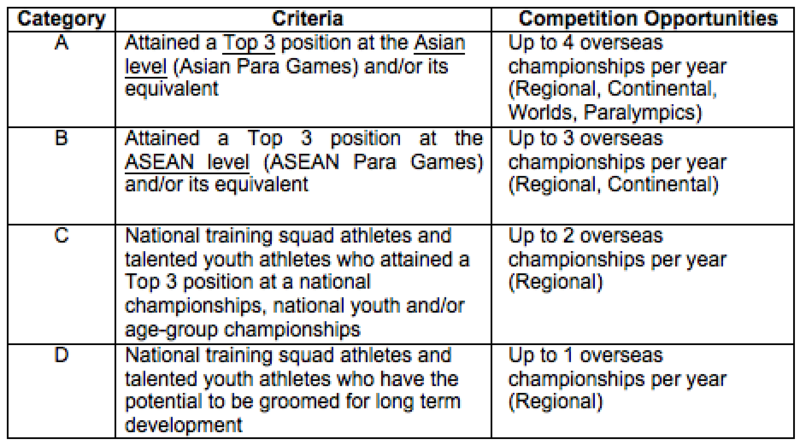 Athletes selected to be in the ASP must be Singapore Citizens and have a good track record of sporting achievements in the preceding financial year (i.e., 1 April – 31 March). Athletes to be selected must be at the top of their cohort in their respective events and categories in local competitions. Athletes to be selected must show potential to excel in major international competitions. Elite Athletes (Category A & B) are those who have proven achievements and have the potential to win medals at the ASEAN Para-Games and beyond. Developmental Athletes (Category C & D) are promising junior para-athletes who have won medals at national and national age-group competitions and can be groomed in the long-run. The athlete’s categorisation lies in the decision of the SDSC Sports Sub-Committee. Should an athlete decide to appeal against his allocated category, they must submit an official request within one week upon notification of their allocated category by SDSC to the SDSC Sports Sub Committee. However, consideration for appeal will be made on a case-by-case basis and SDSC will not entertain subsequent appeals thereafter. Winners of local competitions will be invited to join the SDSC’s Athlete Support Programme. Likewise, interested winners can write in to request admission into the Programme during the months of December – March. They must submit their records together with a brief of why they would like to be in the Programme. New applications thereafter, are open throughout the financial year up to July only and will take effect only from the middle of that financial year (from September onwards). Should an athlete be selected and agree to be in the ASP, he will be required to sign an SDSC – Athlete’s Agreement form (see Annex 1). ASP athletes must abide by the following conditions as stated in the Athlete’s Agreement Form. A breach of the conditions would result in immediate disqualification from the programme and further assistance under the athlete support schemes. A half-yearly review (see ASP Progress Report Form in Annex 2) will be conducted in October of the financial year to ascertain that all ASP athletes have maintained/improved their performance level and are continuing to maintain an adequate level of training and competition regime for the remaining period in the ASP. There will not be any revisions to any athletes’ categories during the review, except where athletes do not maintain an adequate training and competition schedule for the remaining period in the ASP. All athletes in the ASP will be subjected to undergo a medical assessment whenever deemed necessary by SDSC. The medical assessment will be paid for by SDSC and to be conducted by a registered medical practitioner. Selection of athletes for overseas competitions will be decided by the SDSC Sports Sub Committee. Certain sports are not measured or timed events. In the selection of athletes for such team sports, it is difficult to make selection decisions based solely upon objective criteria. It is the belief of the SDSC Sports Sub Committee that considering the mix of selection criteria with all components, subjective and objective, will result in the selection of the best athletes who will perform as the best possible team. An athlete who attains at least a 70% score from the above table will be selected. SDSC reserves the right to remove the athlete from the selection at any point in time and is not at liberty to justify the removal of the athlete. The Sports Manager shall, within 7 days, by notice in writing, inform the athlete of the SDSC’s decision. Other unexpected life events that may affect the focus and morale of the athlete. The responsibility is on the athlete to give serious thought to his acceptance of the letter of selection. He must be transparent and honest in his communication to SDSC of any impending issues that may adversely affect his participation in the competition that he is selected for. Should an athlete withdraw from the team without a valid and acceptable reason, he is liable to SDSC for the reimbursement of any costs incurred during the preparations for the competition. The SDSC will do its best to send deserving athletes to participate in overseas competitions. However, this is subject to the availability of funds and other more important factors that need to be taken into consideration (e.g., level of security of the host country, high costs of air-tickets to certain countries, other bilateral considerations, et cetera). The Sports Excellence programme is an elite programme introduced and administered by the Singapore Disability Sports Council (SDSC) to identify and develop world-class athletes. This programme challenges athletes to excel in sports and achieve their maximum potential through a structured course of intensive training coupled with opportunities to compete at the highest levels. The Sports Excellence programme has over the years successfully produced a number of regional and world-class athletes for Singapore. Establishing a local network of an elite level of competitions in Singapore and create opportunities for more overseas competitive exposure. Develop a comprehensive coaching framework to provide continuity in coaching practices throughout all levels of the SDSC sports programmes. Develop a comprehensive framework for the management of athletes, in terms of support, from recreational level to elite level in order to create a clear development pathway. Establishing sports intelligence database of competitors. Establishing a Centre of Excellence for disability sports, providing for the disabled-friendly facilities and equipment to support and enhance their development. spexCarding provides an enhanced level of support for athletes by Sport Singapore. In order to be part of this programme, athletes are required to be nominated by their National Sports Associations (NSAs). Through this programme, athletes are allocated spexCarding levels based on their performance and achievements. Athletes under the spexCarding Scheme can also approach the Athlete Life team for opportunities and support. spexBusiness was launched in November 2013, to assist national athletes to achieve their career goals without compromising their pursuit of sporting excellence. This national initiative also seeks to prepare our Team Singapore athletes for the eventual transition to life-after-sports. spexEducation looks into implementing a support system to help student-athletes achieve their sport without comprising on their academic aspirations. Access to a network of 57 athlete-friendly spexBusiness companies across various industries offering various work exposure opportunities. Gain a head start in setting up their business through mentorship guidance, resources, and connections. Access to athlete life coaching that guides them into planning and making decisions and proactively prepares them for transitions ahead. Please refer to the attached Athlete Life Fact Sheet for more information. For information on the SportSG spexCarding Scheme and other High-Performance Sports Support programmes, please refer to Singapore Sports High-Performance Sports Support. The Singapore Disability Sports Council (SDSC) swimming programme aims to raise the profile of the sport in Singapore and to promote participation at both development and elite levels. For more information about the WorldPara-Swimming points calculator please click HERE. The information below show the requirement to enter SDSC Swimming programme. The criteria below does not guarantee an invitation into SDSC Para Swimming Development Programme 2018 but it should be seen as a prerequisite for consideration. Athletes selected for this programme are seen as potentially possessing the skills, ability and attributes to progress onto a SDSC Para Swimming Elite Programme. Athletes will only be considered for invitation to the programme providing they have either a WPS S1 – S13 inclusive, WPS or INAS Classification (S14). Athletes must be a registered to a swimming club affiliated Singapore Swimming Association (SSA) or from MOE Sped Schools. Only athletes with the minimum age 12 years (age as at 31 st December 2017) will be eligible for consideration. Only recognised WPS offered events that are published in the WPS rulebook for WPS Regional, World or Paralympic Games may be considered. Any change in an athlete’s classification at any time for whatever reason during the year will result in a review of the athlete’s place on the programme. If the athlete has not achieved a consideration time for their new classification within an agreed period of time (minimum 3 months from the date of classification change) the athlete will be withdrawn from the programme. Split times or performances from time trials will not be considered. All athletes will be required to be showing the required progression along the athlete pathway. Athlete will be reimbursed 95% of the coaching fee (Capped at S$150 per month). Only SSA affiliated swimming clubs programme are eligible. Able to attend a minimum 75% training attendance set by the swimming centre. Athletes/Swim clubs to submit the receipt for the reimbursement by end of the month. Acceptance of invitation to the SDSC Para Swimming Development Programme 2018 is subject to all SDSC conditions and requirements. Athletes are reminded that their place on the programme is a privilege and not a right and are expected to remain fully committed to their training. Athletes will be reviewed every 6 months, this is to ensure the continuing to progress and fulfilling the requirements of the programme. After this point some athletes may be removed from the programme or given a period of time to achieve goals that have been outlined. The review will be done between coach and SDSC to track athlete on positive performance progression profile. Any athlete failed to meet the requirement or no longer show progressing on performance may be removed by SDSC and opportunity may reserve for a better next candidate. There shall be no right of appeal if an athlete is unsuccessful in obtaining a place on the Programme. For training cost enquiry, please directly contact Mr Ang for more details.